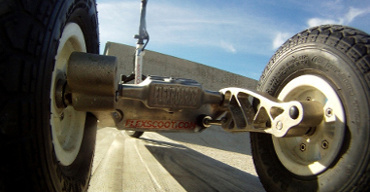 FlexScoot designs and manufactures with passion "small vehicles" since 2000 : skateboards/mountainboards first, under the FlexBoardz brand, then electric scooters as FlexScoot and now mobility scooters. Common denominator is the independant leaning wheels design and the dynamic stability and safety that this technology provides. We use our products on a daily basis and abuse them frequently to warranty efficiency, convenience and reliability. Our website and comunication are minimalist but do not hesitate to contact us if you want additional information about our products, we are always happy to exchange with you.